BORDER LEAGUE – SHOTTON TO PIECES! The first three runners – Lee Jones, Tomos Roberts and James Roberts – all followed the right route despite the absence of a marshal at a key point but the rest of the field were then mistakenly directed by a marshal on a second loop, meaning that they covered 5.5 miles instead of the scheduled 4.2 miles while a few others completed three loops! Total chaos! A great shame seeing that Eryri did field a full team of seven runners for the event with Ali Chant leading the way in 43rd place followed by: 65th Tony Woodall. 86th Gary Porter-Jones. 90th Arwel Lewis in what would have been his 99th completed Border League race for the club! 111th Dylan Owen. 266th Don Williams who turned out last minute despite suffering with a virus and a recurrence of his foot injury to make up the team and 290th the ever reliable Iorwerth Roberts. New race organised by Jenny Heming. Y Ganolfan, Tregarth. Registration from 6pm. Entry form here or on day. Below are the latest standings of the Eryri Mountain champs, after inspecting the current Moelwyn results, it’s currently pretty impossible to decipher them, so will hold on them for a while! Cadair Idris is the next counter. “Another amazing run by John Spill but what an outstanding run by Caitlin Rice? She travelled all the way from Glossop Dale just to win an Easter egg and take over four minutes off Lisa G’s record. Next week is rough and tumbles of Moel y Gest. Remember your numbers. U/12 Georgia Parkinson 1st overall! Ahead of Jack Cain, while Sion and Catrin took the under 14s. Please find below the long awaited results of Ras y Moelwyn (yes in this age of electronic timing a mere four days seems a long time to wait!). Now, before anyone starts emailing me and grumbling please be warned there are some glaring errors in there, as for some reason the timekeeping and results didn’t go quite to plan, so don’t shoot the messenger. I gather the organisers are working on it so please contact them with any amendments, not me. Anyway, a brief overview of this the second counter in the WFRA North Wales Series. Jackie Lee reversed her fortunes following her third place at Llantysilio with a strong win after some top descending, overcoming Caitlin Price on the rough ground. Andrea Rowlands followed up with a strong third overall. For the gents, contrary to what’s written on the results (they have the top two men wrongly as v40s), Martin Cliffe took 4th overall and 2nd v40 behind Mercia’s Paul Jones in 3rdoverall. Craig Jones was 9th overall, and possibly 3rd v40 but who knows! I won’t try to second guess the ladies or any other vet results for that matter as they’re all over the place, but I can say that Ellie Salisbury took a flying tumble and left some blood and skin all over the place. 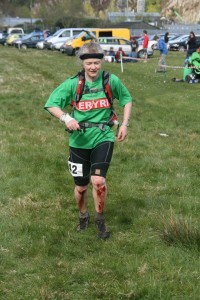 In true fellrunner style she gritted her teeth and finished well, though her face whilst being attended to in the first aid tent was a picture! Just a quick reminder to get your entries in for the imminent running of round 2 of the British champs. The race is the legendary Ennerdale Horseshoe – a grand day out which takes in some classic Lakeland peaks such as Pillar and Green Gable. At a mere 23 miles the race offers a good introduction to fell running and the opportunity to count for the club in the British champs – especially if your female, as Eryri lead the team champs after round 1 at Slieve Donard. Alun Vaughan became the first Eryri Harrier to successfully defend his Welsh Marathon title, finishing 16th overall in the London Marathon in a very good time of 2:26:30. In all, there were 7 Eryri Harriers who completed the London Marathon: Daniel Kashi 2:50:58. Aaron Nicholas 3:06:47. Gwion Williams 3:24:09. Eurwyn Edwards 3:54:19. Michelle Fildes 3:39:59! and Iorwerth Roberts 5:14:47. 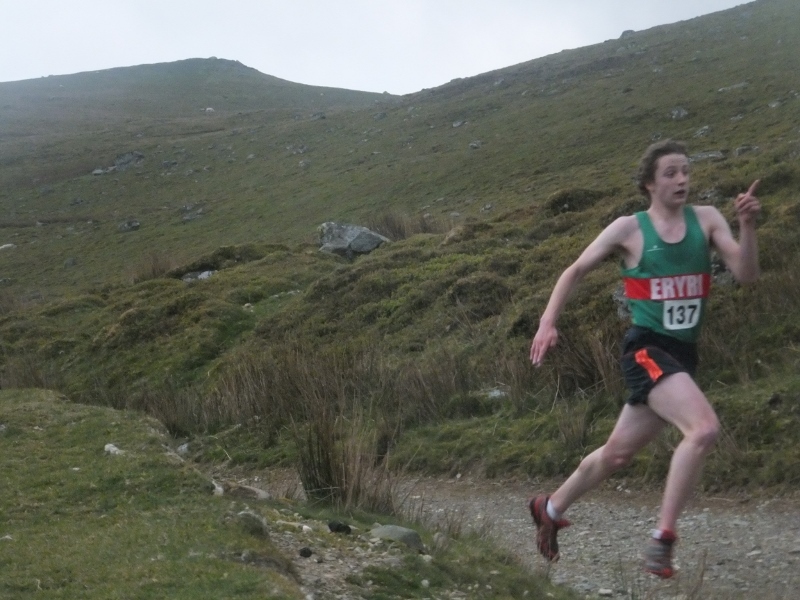 Two Eryri Harriers were amongst the 185 finishers in the Easter Saturday 19th April event won by Menai T&Fields Carwyn Evans 16:54. 92nd Martin Williams 26:55 and 113th Iorwerth Roberts 28:05. U8 victory again to Jake and Megan, U10 Connor and Georgia P, U12 Mike Spill and Ffion and U14 Keiran W and Catrin D.
“While Math’s away the mice will play. 1st win for Gwyn and 2nd win for Bronwen, the latter now holding the U16 and U18 records in both races. Second place overall saw a return by John Spill, 4’ taller and 4 yrs since he last raced, watch this space! Other highlights were John Morris, two V70 records on the trot and Sion Jones in the U14. Sion was once again in the leading pack with the seniors before turning off and setting a new U14 record again. Thanks to all the helpers and local businesses who donated the prizes, remember to bring your numbers to the next race.